Norway’s capital has one of the fastest-growing populations in Europe and as talented entrepreneurs, architects and designers flock here, Oslo Fjord Guide takes the temperature of this fast-changing city. Oslo - Norway's capital - is centrally located in the heart of Scandinavia , bounded by the fjord and forested hills. Arriving Oslo by ship is a beautiful scenic experience, with all the small charming islands in the Oslofjord. The cruise port is situated in the heart of the city, in a great location right below Akershus fortress. This medieval castle and royal residence dates back to 1299 and it's a nice start for cruise passenger tours of Oslo. In the 8th century, a settlement was built right at the top of the Oslo Fjord. This little Norwegian village grew rapidly during Viking times: agriculture, trade and shipbuilding were important commercial activities, and Oslo has truly earned its title of "Viking Capital". Oslo was founded long after the town had been developed by the Vikings. According to the Viking sagas, the city of Oslo was founded by King Harald Hardråde in approximately year 1050 AD. More recent archeological findings, however, prove that the city was founded as far back as in 1000 AD. The founding of the city took place in the turbulent period between the Viking Age and Norway's Catholic Middle Ages. Many remnants and ruins from Ancient Oslo can be found in the Memorial Park. The city had a fascinating, interesting and dramatic history. Oslo´s population was substantially reduced during the time of the Black Death in 1348 which claimed over 50% of the inhabitants. This epidemic also had political consequences for Norway, which became reduced to a province of Denmark. During this period Copenhagen was the actual capital of Norway. Oslo was also greatly affected by the Lutheran-Protestant Reformation of 1537, with religious conflicts, political separation from the Catholic Church and the foundation of a Protestant National Church. Many ruins of churches and monasteries (for example Cistersienserklosteret - the Cistercian Abbey - at Hovedøya) bear witness to this process. Oslo was completely destroyed by fire in 1624. The Renaissance King, Christian IV of Denmark and Norway, decided to move Oslo from what we today call the Old Town, and rebuild it under the protective shadow of Akershus Festning (Akershus Fortress). Following intense renewal work and advanced city planning in the spirit of the Renaissance, a completely new city was created and named Christiania in 1624. After 1814 Norway was united with Sweden, and Christiania experienced very strong economic and political growth with substantial expa sion right up until the dissolution of the union with Sweden and independence in 1905. After the celebration of the 300th anniversary of Christiania in 1924, it was decided that the original name of Oslo was to be re-instated as of January 1,1925. The capital of Norway is situated in the inner end of the about 100 km long Oslofjord. The fjord and surrounding forested hills make a magnificent scenery. Oslo city's reference points are 59°55"N and 10°45"E, as far north as, for example, Helsinki, St. Petersburg, the northerly part of Kamchatka, Anchorage in Alaska and Kap Farvel in Greenland. Its area covers 454 km2 (175 sq miles), with 242 km2 (93 sq miles) of forest, 8 km2 (3 sq miles) of parkland and recreational areas, and some 40 islands and 343 inland lakes. Even though the city is situated so far north, its climate is temperate in the autumn and warm in spring and summer. There is usually snow for 3 to 5 months of the winter, and skiing conditions are good in the hills around Oslo between December and April. From May to July the weather can be quite warm with long periods of sunshine. Drought can also occur from time to time. This is due to Oslos northerly position, well protected by the mountains from Atlantic rainfall, and favourable help it receives from the Gulf Stream. 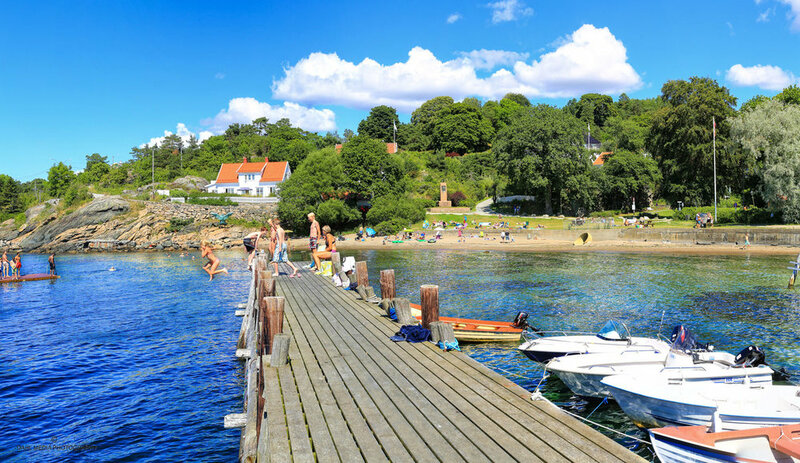 Statistically speaking, Oslo is Scandinavias sunniest capital.